It’s hard to imagine, but there was a time when you couldn’t just go to the store and pick up a carton of delicious ice cream. Before the invention of modern refrigeration and freezing techniques, it was very hard to keep any type of food cold for any length of time. But in Europe, as the news was spreading that a “New World” had just been discovered, those rich enough to get their hands on it were enjoying something similar—Italian gelato. When we say rich, we mean really rich. There are records of the Medici family—one of Italy’s most powerful dynasties—serving frozen gelato-like desserts on special occasions. As far as we can tell, the Medicis were instrumental in spreading the word of this delight across Europe, although the real credit belongs to whatever privately hired cooking staff members did the hard work of making the gelato. The invention of the ice cream maker made it easier to make gelato, although it was still very difficult to get the critical ice or snow ingredients unless you lived high in the mountains. That invention happened shortly before the start of the 1700s, apparently the work of a French fisherman. Hopefully he didn’t try to market fish-flavored Italian gelato! So, what did this ice cream ancestor taste like? Well, if we are to judge from the gelato still made by hand today in Italy, it was a lot like the ice cream we know and love today. 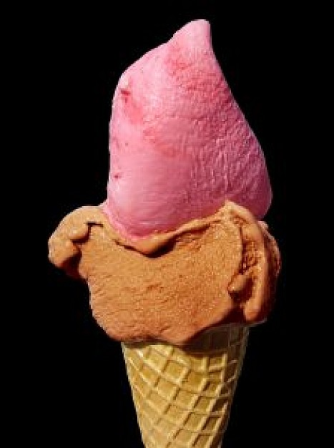 Modern gelato is lower in fat than other types of ice cream, but it is a little sweeter due to a higher sugar content. Many people prefer it over ice cream because it is much denser and therefore more flavorful. If you’re interested in learning more about Italian gelato, you can find the information you crave on our special gelato page. You may be a die-hard ice cream fan, but it’s always fascinating to get a taste of what other cultures think of as the perfect frozen treat. In fact, in some ways gelato lovers are even more passionate that U.S. ice cream lovers. They often settle for nothing less than handmade; they know just how cold the gelato should be when served; and to be fair, they have more history behind them than we ice cream folks do. So go ahead—treat your family like the Medicis and see what you think of this centuries-old dessert that millions still love.